PA Cage Fight held PA Cage Fight 31, Easter Eve, March 31 from the Woodlands Inn and Resort in Wilkes-Barre, Pennsylvania. 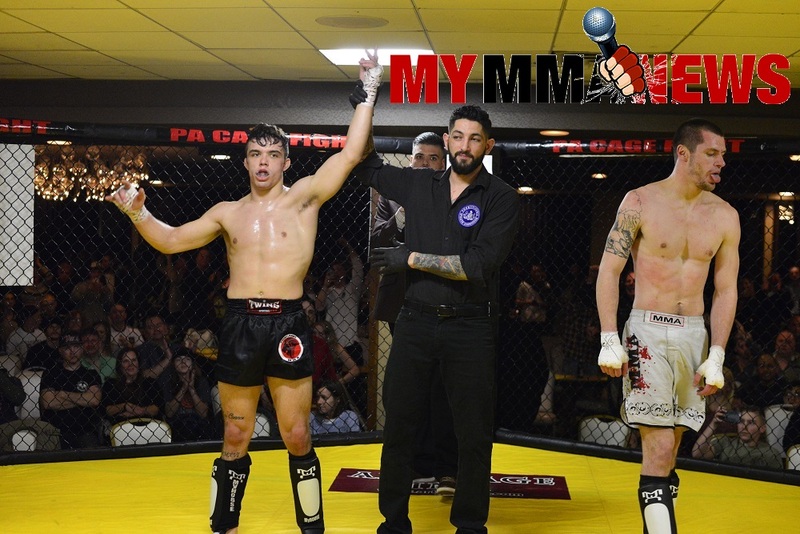 In the main event, PA Cage Fight flyweight champion Sean “Shorty Rock” Santella defended his title against undefeated challenger Charles Johnson. Going into tonight’s fight, Santella of Miller Brothers MMA and Nick Catone MMA and Fitness was ranked as the #1 flyweight on the east coast. Johnson is ranked #1 in the midwest. A win for either competitor could propel them into the UFC. Right off the bat Johnson threw a kick and Shorty caught it. Shorty begins to climb his opponent’s back. Johnson peels Santella off and throws him to the ground. They get back to their feet and Shorty connects with a big right hand that hurts Johnson for a brief moment. Santella again begins to try and climb. Johnson hits the champ with a knee on the ground and Santella moves to a guard position but Johnson backs away. The two men are forced to stand and start again. They begin to exchange leather once again and Santella goes in for a takedown during the closing seconds of the first round but does not complete. Johnson scoops up Shorty in the second and sets him down on his side. The champ gets back up and Shorty presses forward with his strikes but gets caught with an uppercut from Johnson. Santella throws a beautiful cartwheel kick, but unfortunately for him it only looked good, it did not connect. Johnson comes forward with a knee, Shorty goes in for another takedown. This fight is non-stop action. They close out the round just going all out. Amazing scrap thus far. The first two minutes of the third round is the fighters feeling each other out back and forth in the striking department. Shorty connects with a right hand that stuns Johnson. Santella continues to pick his shots. He throws a front kick that connects. Johnson comes alive in the final minute and really pours it on the champion but will it be enough? The final bell sounds and the judges render their decision. Santella wins unanimously and the crowd chants “UFC” following the announcement. The evening opened with a lightweight bout between Torance LaCour and William Mondragon. The bout was scheduled for three two-minute rounds. Not much action in the opening round as the two combatants felt each other out. Mondragon landed a few kicks but no real damage down. In the final 10-seconds of the round LaCour scored a takedown with a slam but time expired before he was able to capitalize. Now a little more comfortable, LaCour came out swinging to open the second round. The fight then moved up against the cage where LaCour tried to work for a takedown. Mondragon hung on to the head and neck area while he punished the body and LaCour was never able to complete the takedown. We move to the third and final frame. Mondragon immediately attacked the leg working for a submission. LaCour scrambles and survives and is now inside Mondragon’s guard. LaCour lands brutal body shots. This fight will go to the judges. LaCour wins by way of split decision. 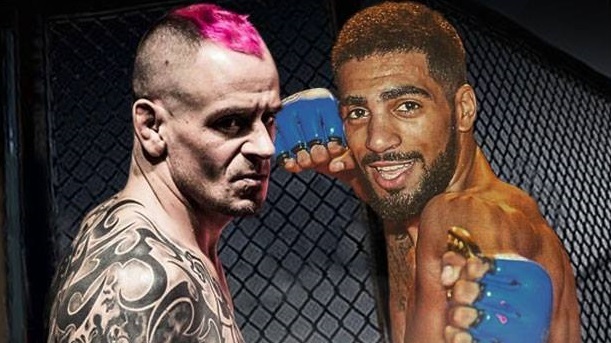 Edmir Sokoli and Mike Pate came swinging like two men on a mission in their mixed martial arts debuts. Sokoli was able to drop Pate but sustained a cut under his eye in the process. With blood flowing, the Nick Catone MMA sutdent Sokoli worked for a guillotine but was unable to force the tap. The striking war ensues once again in round two. Sokoli stalks Pate and drops him. Pate looks to regather his composure and work the ground but Sokoli backs off and forces Pate back up. Sokoli is walking Pate down with a flurry of punches. Promoter Paul Matreselva Jr. is screaming to stop the fight. Sokoli drops Pate again and referee Jimmy Chappell stops the fight in the second. Donnell East of Longo-Weidman MMA and Thomas Salmon of American Killer Bees also made their MMA debuts tonight in Wilkes-Barre. East is being cornered by UFC bantamweight fighter Aljamain Sterling. Right away it is apparent that Salmon is looking to work submissions while East is more of a pressure fighter from the top. In the second round Salmon locks up a triangle and East picks him up and slams him on his head. Fans jump out of their seat and Salmon switches the lock to focus on the arm. With just seconds left in the round East survives the submission attempt. Salmon working on submissions right away again in the final round. East passes the guard, survives and attempts a guillotine of his own in the closing seconds. Salmon wins a split decision. Temo Kvirchishvili landed a devastating throw on Tyree Thomas in the opening minute of their scheduled three round fight. Kvirchishvili is on top of Thomas here in the second frame and is throwing down thunderous strikes to the body before Thomas gives up his back and is submitted with a rear-naked choke. Kelvin Sterling was taken down by Max Potter and found himself fighting off his back as Potter worked for a rear-naked choke in the opening 30-seconds of the fight. The first round ended with Sterling still locked in a body triangle and defending the choke. Sterling finds himself in a better position in the second round. He has Potter up against the cage but not really doing much damage. Referee Jimmy Chappell tells Sterling that he needs to do work if he wants to maintain the position. Sterling lands several takedowns in the third and final round and should win the round and the fight by way of a decision. Aljamain’s brother wins unanimously and records his first victory. The final preliminary bout featured Zach Miller taking on Luis Rivera. This was a hard fought battle contested mostly on the feet. The taller fighter Miller had a reach advantage but that did not keep Rivera from looking to stand and trade. In the final 10 seconds of the fight Rivera came forward and connected with a big left just before the bell. This fight goes to the scorecards. All three judges saw the fight goes to the Rat Pack Fighting Systems fighter Miller. Cristian Santos and Chris Sperow opened up the main card following the intermission. Santos of Miller Bros MMA worked Sperow up against the cage and began to punish his opponent with knees. When the two fighters separated Santos kept Sperow at bay with crisp striking. The first round concluded with Santos teeing off on Sperow. Chris begins to protect his jaw in the second round and manages to get Santos up against the cage now. Santos works out and begins to chop the leg. Sperow throws Santos but Santos gets on top and begins to land strikes to the dome. Referee Jimmy Chappell calls an end to the fight in the second round. Santos wins by way of technical knockout. Vinny Oristaglio and Nate Fultz are not afraid to strike here in the first round of their three round affair. Oristaglio connects with a big hook that knocks Fultz down in the second and Vinny immediately swooped in for a rear-naked choke. The transition happened so quickly. This one will be a highlight reel for sure. 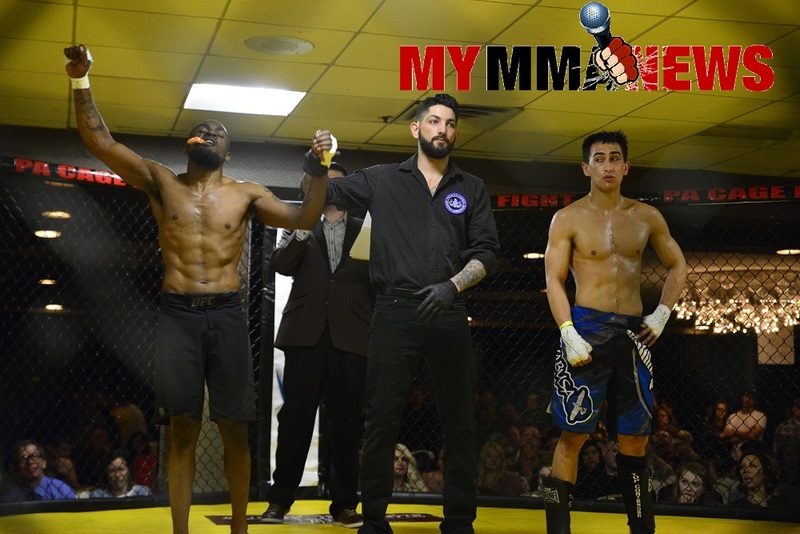 Vinny Oristaglio is your new PA Cage Fight amateur lightweight champion. What a pop for James Geiger as he entered the cage against Colin Hartey. The crowd is on their feet cheering “Geiger, Geiger, Geiger.” Geiger stormed out the gate with a takedown and began the assault to the body. This could be a 10-8 round in favor of the fan favorite Geiger. Hartey finding no success against in the second. Geiger is on top and not allowing his opponent to breathe. He is absolutely smothering him. The crowd again begins to cheer on their star. Hartey finds a brief moment of success as he escapes the onslaught from Geiger but then finds himself back on his back and up against the cage before the round ends. Round three opens with a brief exchange of punches followed by another Geiger charged takedown. Geiger cranks on the arm and when that doesn’t work he lands strikes to the rib cage. The fight ends with Geiger on top and it looks like he will win unanimously. Matreselva Jr. announces that Geiger will be fighting again June 16. Omar Kellom and Alex Snyder met in a rematch tonight at the Woodlands. Snyder won the first bout several years ago but tonight a title is on the line. Kellom unleashes on Snyder who is shooting in for a takedown. The fight goes to the ground and you can’t really see what is going on as the fight goes to the ground. It appears as there is not much movement. Then the bell sounds, Omar stands up and is just drenched in blood on front and back. Snyder’s nose is a faucet. Omar is cleaned up and Snyder gets worked on. The fight is allowed to continue to a second round. Snyder is now on Kellom’s back working for a choke but he is bleeding all over Omar. Kellom is belly down as Snyder is working strikes from the top. Snyder swoops in for a takedown to open the final round. Kellom throws brutal strikes to the body. Snyder is in a full mount position now but can’t get much done. The fight goes the distance. Snyder will win the bout but the picture would tell a different story. His face is a bloody mess while Omar doesn’t have a scratch on him. Daniel Tolbert and Tyler Bayer met in the evening’s co-main event. 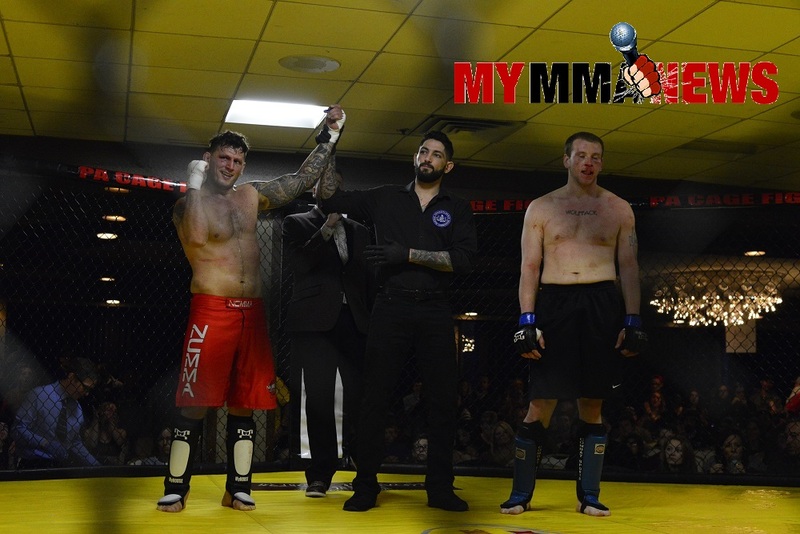 Tolbert of Algeo MMA and Kickboxing took it to the former PA Cage Fight middleweight champion right away. Tolbert shot in and took Bayer down but flew him half way across the cage in the process. From there the thuds of the strikes he landed from top position could be heard and felt over the loud crowd at the Woodlands. Bayer locks on a triangle choke and forces the tap. Bayer moves to 2-1 as a pro.